Description: You are viewing a beautiful tall vintage blue and white marbleized Royal Haeger vase accentuated by a top rim that is scalloped. It is marked and has it's original label. 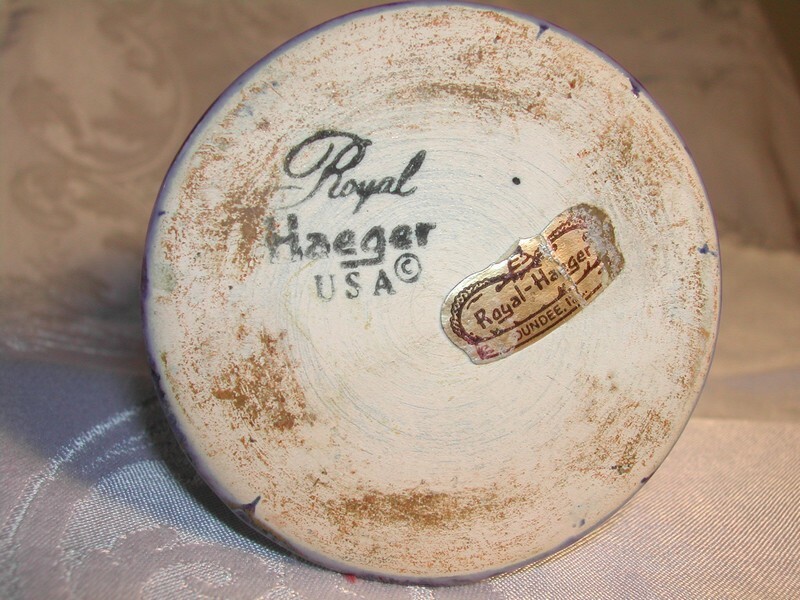 The mark is black ink and reads: Royal Haeger / USA and the label is gold with a black crown and lettering: Royal-Haeger / Dundee, Ill. Condition: Very good condition, no cracks, just three small chips (ceramic is exposed) to the underside of the scalloped edging. They are together, so if you turn the vase you don't even notice them. These small areas could be colored and glazed easily. These are handsome and unique items to use and display, to ask questions or to see enlarged and more detailed photographs of this item please e-mail anne@amtreasures.com or visit: AM Treasures / New Arrivals / Miscellaneous Decorative. In 1871, the same year as the great Chicago fire, a young German immigrant named David H. Haeger founded the company originally known as Dundee Brickyard. Over the next 130 years under four generations of family leadership, this small town brick-maker was to become America's oldest and largest production pottery. Haeger's famous glazes, frequently imitated but never successfully copied have always been made by expert craftsmen. Royal Haeger: In 1938 design genius Royal Hickman joined the company to introduce an extraordinary line of art ware, called Royal Haeger. Hickman’s work was daringly intricate with smooth, flowing lines and highly original glazes. Public demand in the late 1930's for Royal Haeger was immediate and strong and extended into the 1970’s.